So I have been working with Ron now for almost 5 years. Most of my time is spent “front of house” so to speak. However, I still get to “observe” the daily happenings of the production room and kitchen. Because I am always up for a challenge, I thought that I would make a min-cake for a friend of mine out of cake scraps. I made my own tiers by using circle cutters with the cake scraps. I filled the cake, and did tops and sides, just like our head chef. Because my little cake was so small and it was on a make shift cake board, this was very difficult for me trying to get my buttercream all even. I had to frost the cake while it was on the palm of my hand. Once my cake was filled and the tops and sides of my little cake were buttercreamed, I put it in the fridge to let the buttercream get firm. Now it was time to try my hand at fondanting. It took me two tries but I did it. Now working here, we have a fancy sheeter that rolls our fondant very thin. I have only eaten fondant and never covered a cake. I watched my head chef do this over and over again and I am always so intrigued as to how he gets these cakes to look perfect. I can tell you right now, covering a cake in fondant is DIFFICULT. Once my little cake was covered in white fondant, I put it in the fridge. I then rolled out yellow and green sugar paste to make my little circle cutouts to decorate with. 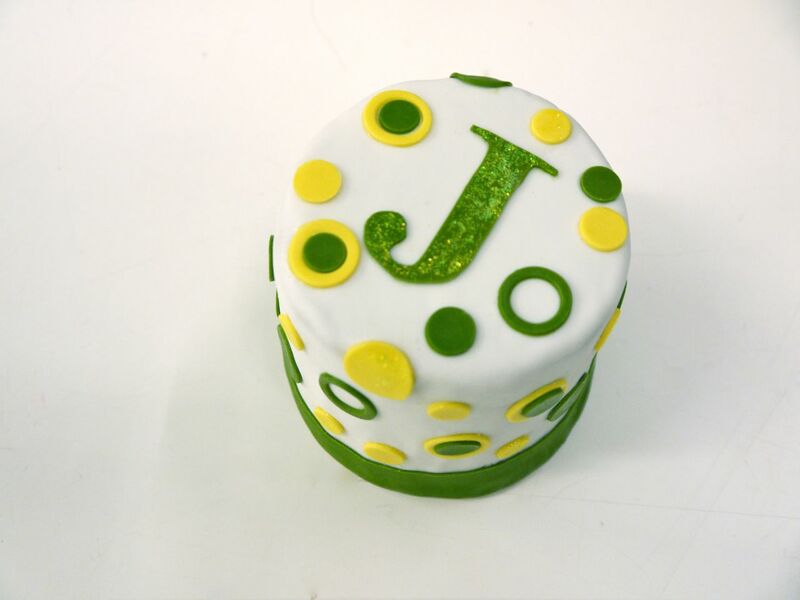 I also did a “J” on the top of my little cake to personalize it more. I put a band at the base of the tier and as a finishing touch, added a little “disco”. Decorating my little cake was really fun. But was very time consuming, and I had to exercise a lot of patience with a much needed steady hand. My first attempt decorating a little cake Ron Ben-Israel Cakes style. You’ve done a grand job! Bravo! Your cake is precious and how great that you learned an invaluable lesson. That cake is adorable! And yes, covering a cake in fondant (no matter how many hundred times you’ve done it) is ALWAYS a stressful process! Well done! Small cakes are always more of a PITA than large ones. Nicely done! And how refreshing it always is to hear how much you love your job. I’m sure they love you, too.